Joe Smith of the Tampa Bay Times: The Lightning being able to trade for defenseman Erik Karlsson might be a pipe dream, but it’s not an impossibility. The Senators have said they don’t want to trade, but what if they get an offer that they can’t refuse? Detroit Red Wings rental defenseman Mike Green could be another option for the Lightning. 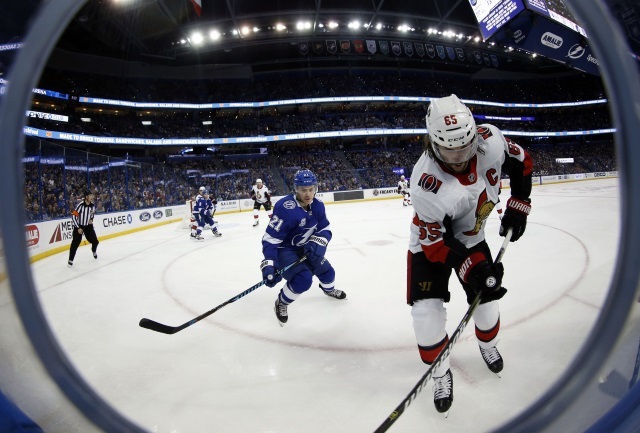 If the Lightning were to go after Karlsson, they could offer the Senators Vladislav Namestnikov or Tyler Johnson, a prospect like Taylor Raddysh, a draft pick or two, and maybe a defenseman like Jake Dotchin or Slater Koekkoek. That might not be enough for the Senators, but it could start the trade conversation. Trading Karlsson at the deadline won’t likely happen though. It might be considered in the offseason it contract talks don’t go well. The Lightning wouldn’t move Brayden Point for possibly only a year and a half of Karlsson. Doubtful they would move Mikhail Sergachev. Emily Sadler of Sportsnet: Nick Kyproes said that GMs are telling him that the Canadiens are asking for a lot for Max Pacioretty, and it’s helping drive up the costs for all players. When trade deadline day comes, the prices may come down. Chris Johnston added that trade talk is quiet even with the sellers.